On paper, the 36One (a ride that both Hendrik and I have completed) is a third of the distance and the greater part of the climbing. Yet the majority of finishers complete 36One in around a day. By the numbers, Munga looks the lesser battle, further but with proportionally less climbing and much more time to complete it. Clearly, those numbers cannot be telling the whole story though. Far stronger riders than T and I have had multiple DNFs in their attempts to finish. 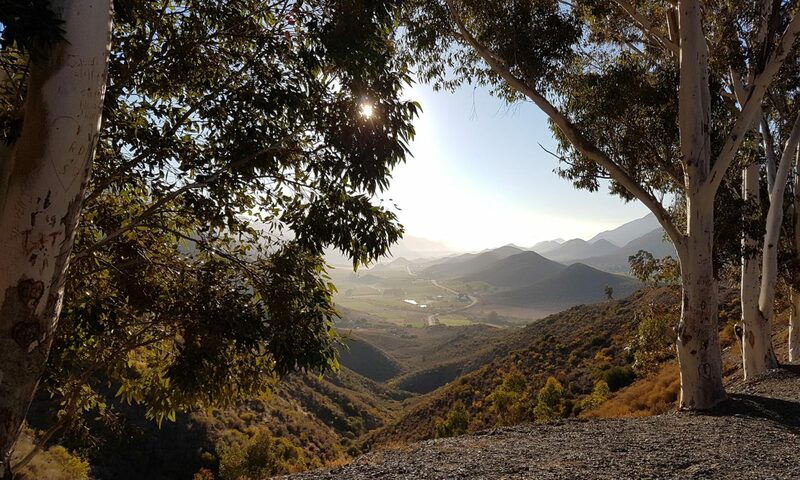 Fellow Cape Randonneur, Chris van Zyl, will be on his fourth attempt this year, and is still without a finish to his name, We begin to speculate the possibility that some invisible beast is out their lurking, waiting for us in the vast expanse of the Karoo. It’s a somewhat chilling prospect given that substantial portions of our ride will be alone, and at night. 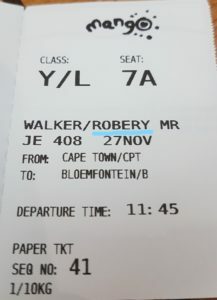 It’s hard to decide whether it’s some kind of omen, are just plain funny, but the spelling mistake on my boarding card does at least help to break the nervous tension a little. Once past the security checks and in Departures, we bump into fellow riders Richard Baufeldt and Ryan Lewis . Ryan and I recently rode an overnight practice leg on fully kitted bikes a few weeks back. Our discussions today continue on the theme we discussed for much of that ride – the practical, yet pivotal aspects of kit selection, which varies about as widely as we do as riders. With our sole ambition being a finish within cutoff, T and I will be riding a considerably slower pace than both of these guys. Our gear selection is very much orientated around the stuff we need to survive the full five days on the road, although neither of us could be said to have packed heavy. We’ve both paired down to what we each consider the bare essentials. 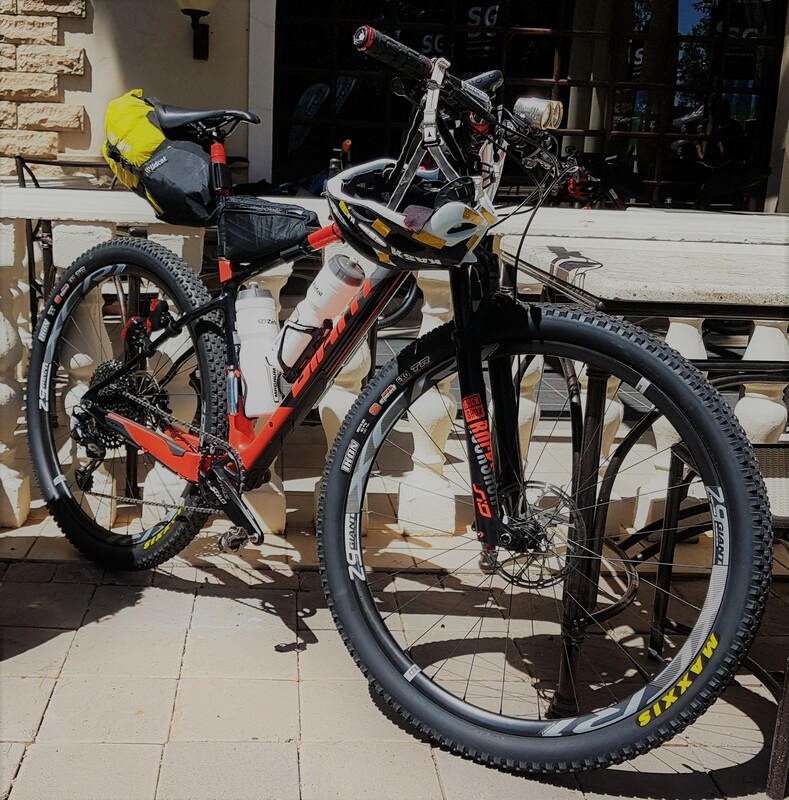 It turns out that a sizeable proportion of our flight is also Munga riders – easily identified by their cycle helmets, Camelbaks, and in a worrying number of cases, insanely sculpted muscles. It’s easy to look around the plane and imagine that most if not all of these guys (and girls) will be vanishing rapidly into the distance ahead of us once the race actually starts. But that’s all fine, slow and steady won’t win this race but hopefully it will finish it. Collecting our luggage from the belt it’s a joy to be traveling without bike boxes – one of the many nice touches of Munga is free bike transport for both Cape and Joburg riders. The shuttle bus is filled as we roll through Bloem. At 60 and 54 respectively, it’s easy to imagine T and I will be in a minority of older riders but endurance events don’t work that way. A significant number of other riders on the bus are around our age group, both men and women. Although there’s no shortage of younger, leaner and faster looking riders too. In front, next to the driver is ‘Benky’ (Kevin Benkenstein) – 2nd place rider in this year’s Race To The Rock, and a definite challenger for the podium. 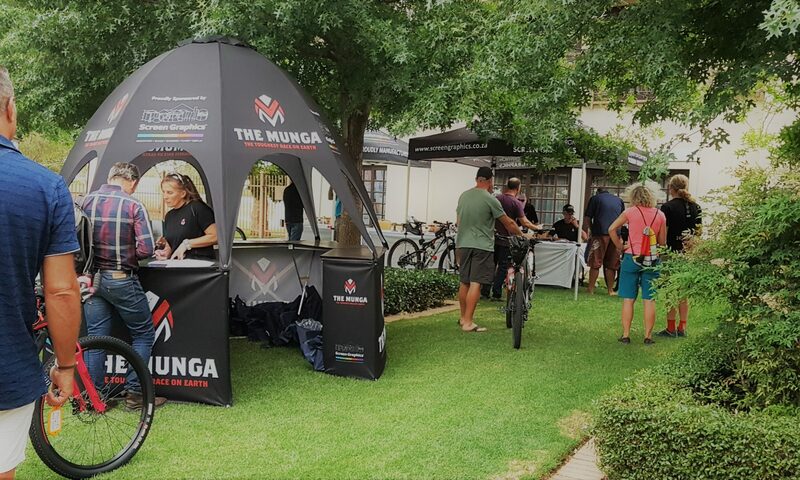 As the shuttle pulls into the Windmill Casino, we spot Philip and the MoveMyBicycle covered trailer loaded up with our bikes, rigged and ready to ride – no messing with multi-tools and setup. What an absolute joy! The usual registration formalities don’t take long, although Ts name has got crossed with Francois Estherhuizen (they share the same middle name). As a result he gets allocated temporary rider number 134, and receives a bike board and stickers with no name or number on them. We bump into a few more familiar faces whilst signing in: Janine Oosthuizen is here who I rode with for part of 36One; and Chris van Zyl grabs my hand and says thanks for the segmented GPS tracks. The supplied race route is one single, long file of 10,000 points. The previous weekend I set aside a couple of hours to split it up into sections of roughly 200km, each file being a leg between Race Villages (RV). From past experience, smaller files present significantly fewer issues out on the road. The diminutive CPUs in typical GPS units are very prone to locking up or freezing struggling to to cope with the extent of tracks longer than 200 or 300km. The heat and humidity are oppressive as we wind our way through the hotel lobby back out to the car park. Our B&B is nearby, and Philip is staying at the same place so we leave our bags in the bakkie and mount up to ride there. The ride may be short, but it proves more strenuous than expected for several reasons: firstly, it’s direct into a now fierce headwind; second we’re all in flip flops which don’t really work with clipless pedals (in my case the leg over extension is borderline painful); and finally is the rain which handily begins to lash down and deliver a decent soaking in the last few hundred meters. The good news doesn’t end there either – there’s been a mixup with our booking and we have 3 double beds for 4 guys. Better still, it’s up an awkward outside staircase too. Nico is on the verge of phoning around for extra accommodation when our recce reveals a large and fairly comfortable looking couch. It’s settled, this will work and T will grab the couch – or almost settled, since Nico insists that as youngest he’ll take the couch. It’s a kind gesture, but Nico does also have the ability to sleep literally anywhere, so it’s probably also the outcome that will ensure most sleep all around. A couple of Spur steaks & waffles with Ice Cream later and the theory is put to the test as we crash for the night. I’ve no idea how well Nico slept, but my own rest is fitful and patchy – a handful of interrupted hours at best. Not ideal with a long first leg of cycling ahead. Day one of Munga is certainly going to live up to the billing of ‘tough’ purely on lack of sleep alone. After watching those dots now look forward to the story. Love your writing Rob! Robbery Walker – classic. Always a nice surprise when you open your emails and find one of these – looking forward to the rest. PS, slept like a baby. Watching the dots for way too long so for 2019 I’ve decided to be a dot……and I’m terrified at the prospect of what I’ve set myself up for….looking forward to the rest of the story Rob! Excellent stuff Mike – you won’t regret it! Rob …you certainly have a great way with words. They conjour up the required imagery to make this read a really enjoyable and fascinating one. Followed the progress of my friend Theunis (T) on the handy App link he provided at that time. Your filling in of the details of this adventure/journey is one I will read with much enjoyment. Thank you!